Ignas Krunglevičius, Interrogation, 2009, two-channel video installation, dimensions variable. Ignas Krunglevičius’s work focuses on unmasking how language is marshaled into the service of power, from political rhetoric and demagogy to psychological persuasion. Interrogation, 2009, for instance, is a two-channel video installation based on an interview transcript from a 2004 murder investigation in the United States in which a woman was suspected of killing her husband with a shotgun. Similar to the way an interrogation room generates a power dynamic and tension from the moment a person steps inside, the layout of the installation is designed to maximize viewers’ discomfort. 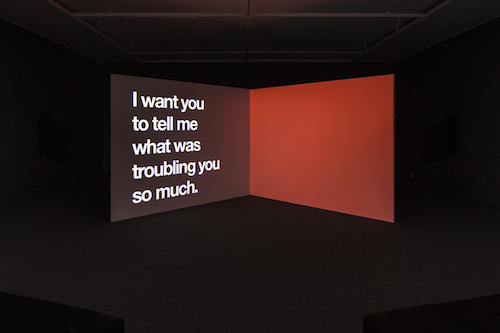 Upon entering the piece, visitors hear a harsh and incessant pulsating sound composition, which is synchronized with the interview dialogue projected on two screens in bold white text on black backgrounds. One screen features the police officers’ vexatious questions, the other the answers of the suspect. The authorities use interrogation tactics such as psychological manipulation, confrontation, and even empathy in order to gain trust and obtain a confession. Throughout, the accused person’s responses read as overwhelmed, as if they are unable or perhaps unwilling to remember or articulate their thoughts. Delays in replying translate into bursts of red, blue, or white flashes on the screens, accompanied by the no less irritating buzzing of electronic music. The persuasiveness of this work relies on the viewer’s exposure to constant noise and flashes of light—which are not coincidentally methods also used for “enhanced interrogation”—leaving one with a strong sense of stress, suggestibility, and vulnerability. This is a visceral experience of the exercise of language as a coercive power, as if one’s self were the very same subject of inquisition.